By LUDWIG VON KOOPA - *snicker* I'd do it better, though. You'd think I would have some level of respect for Stephen Colbert and his career. We're both political satirists, right? Well, you'd be wrong. I'm not a fan of him, his previous show, or his new gig at The Late Show. Though he did help (sort of?) Herman Cain out, once. So... want to play it? Well, it's a click away. It's free. You can play it on both desktop/laptop and also mobile trash. It feels like it was made for mobile first, actually. This constitutes the title screen? It's just the controls with Bernie's hand sticking out. Uh... it's hard to control, I guess? That's obviously intentional and some sort of commentary on Bernie Sanders's arm movements during his speeches. Well, that's why the game was made. Apparently, Bernie moves his arms erratically while doing rallies. If you take a public speaking class, they'll tell you you need to control your gestures appropriately, and talking with your hands is bad. Hand gestures are supposed to be a technique for emphasis, not to be spammed. You're controlling Bernie's right arm (the one on the left from the player's perspective) while the right is static. So yeah, that's the game. 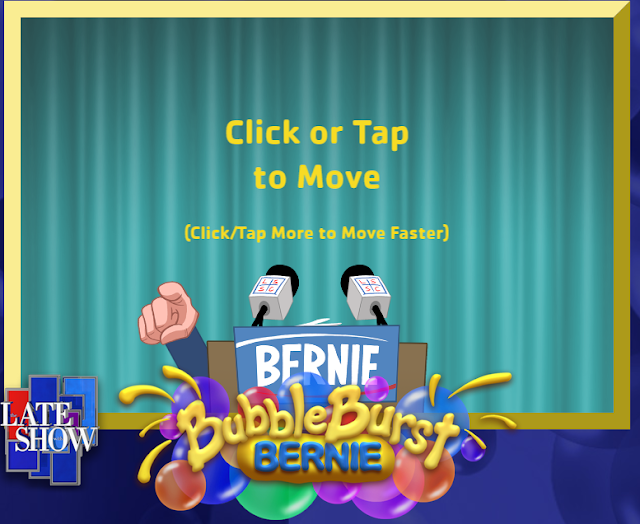 Bernie's arm will follow your cursor without you even needing to click, though he'll be geriatric about it. If you mash your cursor clicking, he'll go faster, but at the cost of control precision. The game varies things with special, more rare flashing bubbles. Pressing these will have a lot of bubbles appear on screen for more point opportunities. It will also make FEEL THE BERN! appear on-screen as visceral feedback. It's a power-up in the sense that Bernie's arm will become a lot more... elastic. So it'll move faster, but also a lot more spastically. It also looks even more ridiculous, too. I won't have a screenshot of how elastic it can get, because this article doesn't want to spoil the whole experience for you. Here's my high score. Can you beat it? ...Eh, you don't have to try. There are more valuable things you could get a high score at. You get 100 points per bubble popped. All bubbles, regardless of colour or flashiness, are treated equally in this regard. That is probably also a social commentary. Of course, there is the constant social commentary of Bernie Sanders blurting out random Bernie Sanders quotes, to basic, low-fidelity music that isn't good and isn't bad. The quotes are the best part of the game, of course, because listening to Bernie Sanders's voice is always fun. The music doesn't change pitch or tempo or anything when you FEEL THE BERN!, so that's a missed opportunity. There's replay value in terms of wanting to hear all the quotes the game has to offer (though you never know if you've heard them all since it's random) and in wanting to have the best score on social media, if you care about that. I've read that the reason there is a time limit to begin with is that it's a social commentary on how long Bernie Sanders has to remain as a presidential candidate. He's not going to be the Democratic nominee for president, so he's time-limited on the stage. So would a Hissing Hijinks Hillary game not have a time limit? While I am generally against time limits in games, I think shutting Hillary up would be an exception. That's why I made the conscious effort to make a Hillary-specific volume switch an obtainable item in Capture the Confederate Flag. Maybe Bubble Burst Bernie could have a boss level against Hillary Clinton, or point goals instead of a time limit to get to the next level. (That also means having more than one level, or any sense of progression at all.) Those could be analogised as quarterly financial fundraising amounts, or maybe the minimum delegates needed to not be mathematically eliminated from the nomination. 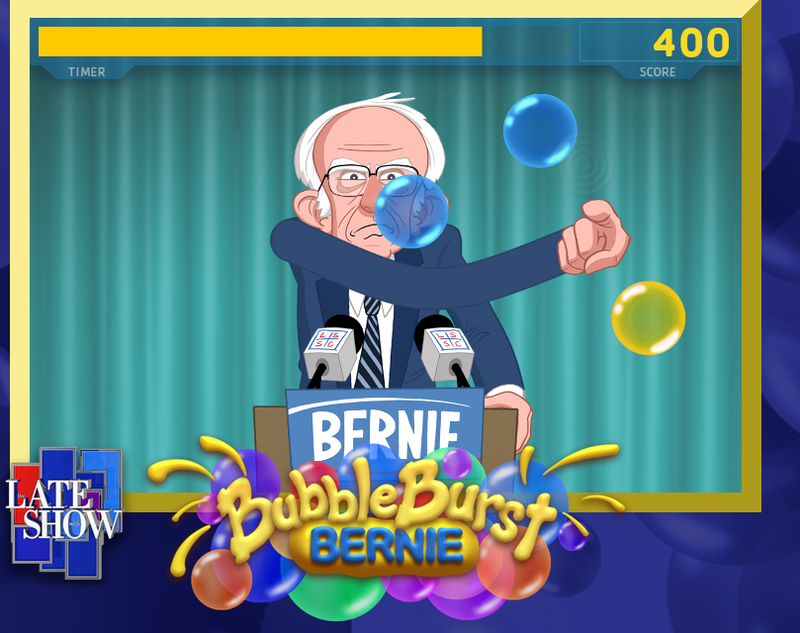 In the time it took you to read this review, you could've played Bubble Burst Bernie several times. I guess it's worth playing once. After that, you can play the aforelinked-to Capture the Confederate Flag. You'd still be playing that in the time it took for you to read this review, and you'd have more fun! And if you write a review of THAT, you can potentially win some gift cards. This wasn't going to be a Review originally and was going to be Gaming Commentary, but the way it was being written it made sense for it to be a Review. 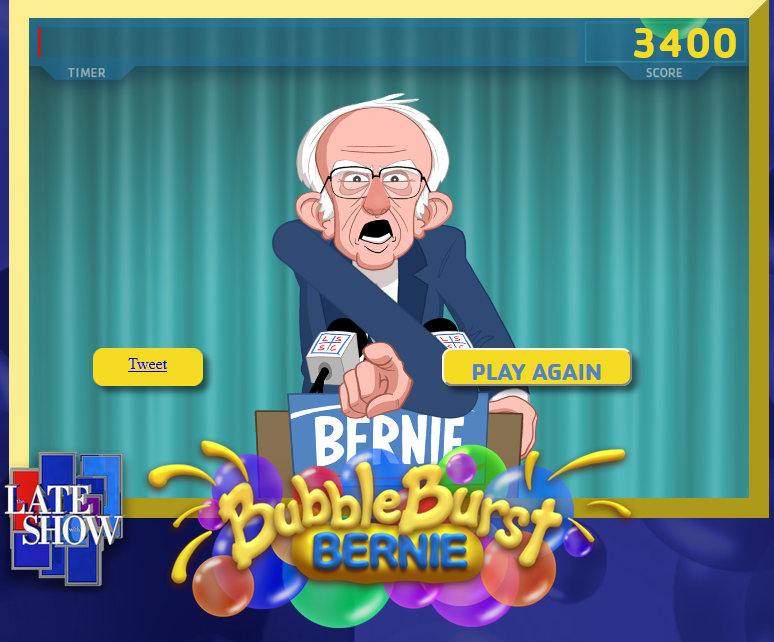 What do you think about Bubble Burst Bernie, or at least the social commentaries it brings up? We'll be taking your comments. 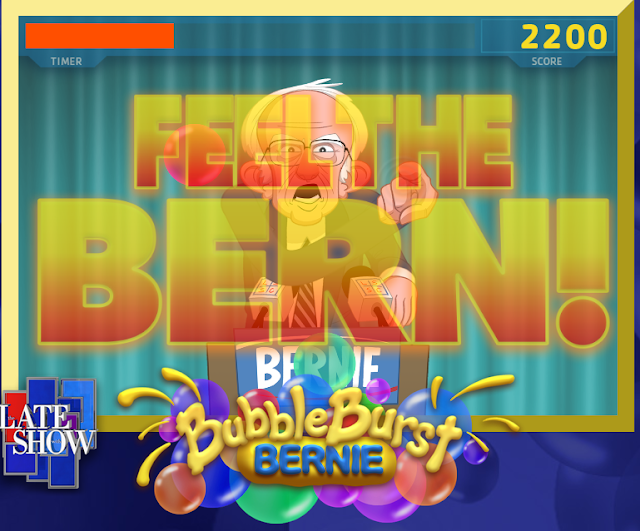 For KoopaTV's Bernie Sanders-specific joke, click here. Features Ludwig trying to imitate Mario trying to imitate a Brooklyn accent, giving a Bernie Sanders style speech. This isn't a joke: Bernie Sanders himself wrote a guest article for KoopaTV! It's Advance Wars meets 2012 presidential campaign. ...I can tell that's not just good, but amazing. I'm jealous and astounded we haven't come across it. I believe I learned about it due to the old Golden Sun fan forum I used to go on had a user who knew I was obsessed with Advance Wars and he liked the series himself. Yes, with both sides for the final level. Any tips on proper use of Press Secretary? It has been years since I played that. I have no idea which parody units are clones of what Advance Wars unit now. Press Secretary is Artillery, I guess. I suddenly remembered where I found out about it. In a Gamefaqs message board; one of the Advance Wars boards. The Golden Sun fansite connection was due to me telling someone else who likes Advance Wars about it. Oh, shoot, too much Splatoon. 'kay no one cares about Bubble Burst Bernie apparently so go to today's article and let's talk about Pokémon. Although it may not be a game, Dancing Hillary is probably closest thing we will get to a Hissing Hijinks Hillary game.